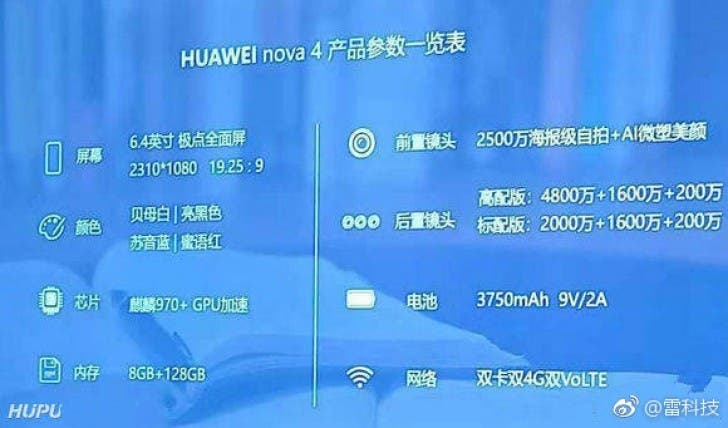 A Weibo profile has discovered a leaked slider that contains some very little info relating to the Huawei Nova 4 which is due to be unveiled in the coming days. 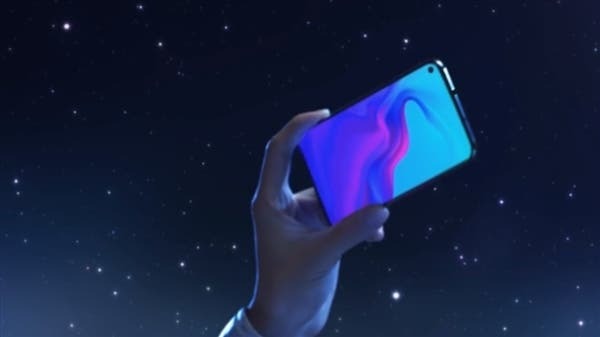 Although the upcoming Nova had appeared on China’s TENAA a few days back, it wasn’t revealing enough, now we can now lay hold of some more details about the upcoming Smartphone. The talking point here is the 48mp main camera. The Honor V20 made a splash when it was showcased a while back with a 48MP main camera, that is expected to be replicated on the Huawei Nova 4. However, the latest leaked slide reveals that only the top end version of the device will get the triple camera rear setup – comprising of – a 48 + 16 + 20 arrangement, while the vanilla version will swap out the first48MP sensor for a 20MP sensor. Dropping the 48mp sensor notwithstanding, the device is still miles ahead of the Honor V20. As per the leaked slide, the Nova 4 will come fitted with a 6.4” display, with 1080p+ resolution, 19.25:9 aspect ratio, while it will come packed with last year’s Kirin 970 chipset coupled with 8GB RAM AND 128gb Storage. It is tipped to house a single 25MP selfie camera under its display, while the whole assembly will be powered by a 3,750mAh with support for 18W charging. We will get to know other specs and pricing later on December 17 when it will be officially announced.